Today’s box review is a little different to all of my others and it is much more exciting. 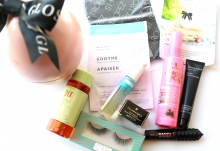 Although getting subscription boxes each month is definitely exciting too. 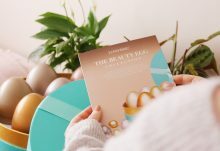 The item in today’s review isn’t a subscription box, it’s the new Lookfantastic 2018 advent calendar which is always very coveted and sought after each year so I’m extremely happy to have one! If you want one then go, go, go before it sells out. The Lookfantastic advent calendar contains a selection of 25 beauty items which range from toothpaste, shower gel and makeup to skincare, haircare, beauty tools and more. 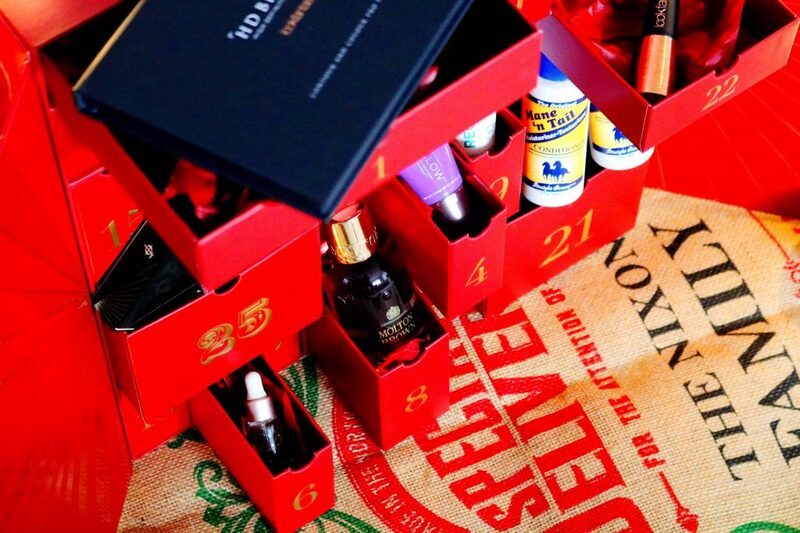 The brands in the advent calendar are almost all higher end or luxe brands with a few more inexpensive offerings too. You’re definitely getting your moneys worth with this advent calendar as it is worth of £300 but you can purchase it for £79! I think the value for money of this advent calendar far surpasses most others on the market right now. Let’s start with number one, the first item in the advent calendar which is a contour, highlight and blush palette from HD Brows. Each item is wrapped in tissue paper and it’s such a treat to open each box! It’s a brand I’ve tried before so I was interested to give this palette a go. I’m surprised to find not one but two full sized palettes in the advent calendar. I’ve only tried the highlighters so far but initially I’m really liking them! I think it must have been quite difficult to select the products to make up the calendar as it’s going to be bought for and used by a wide range of people but I think a micellar water is a good choice. I use a micellar water almost every time I remove my makeup as generally they’re just so effective and I hope that this one is the same. Another universally useful product is this haircare item from Percy and Reed London. I love any kind of smoothing cream or anti-frizz balm and this one is a little of both as it helps to tame my halo of frizz and it leaves my hair smoother and more manageable. 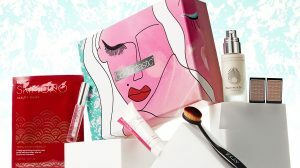 The size of most, if not all, of the products included are great as they are large enough to give it a proper go and small enough to be ideal handbag or travel sizes. GlamGlow is such an iconic brand and one that is beloved by so many beauty aficionados so it’s no surprise that it’s one of the brands included. I have tried a couple of Glamglow samples and throughly enjoyed them but this is one I haven’t tried, yet. I am all for trying new brow products, they are products I use every single day and wouldn’t want to be without. I have the shade ‘Indian chocolate’ but I’m not sure if yours will differ. It’s a perfect match for me, the pencil has a creamy texture but not too creamy and it gives me the subtle definition I want without being too heavy or unnatural. It’s that time of the year when the weather is getting chillier and I change up my skincare routine to include richer and more nourishing products such as oils. I love facial oils for the autumn and winter months especially as my skin is so dry and sensitive, it needs all of the TLC it can. Emma Hardie is a brand I’ve wanted to try for the longest time as the cleansing balm has received nothing but rave reviews. I’m liking the facial oil so far, especially with it’s cute packaging which features a teeny tiny pipette. Mini mascaras are something I love and I wish there were more of them as it takes me so long to use up a full sized mascara that it usually needs throwing away before I’ve finished even half of it. This mascara gives me the natural but defined everyday lashes I want in a couple of seconds – I love it. I’m a little particular when it comes to mascara as the drier the formula the better but this one strikes a nice balance. 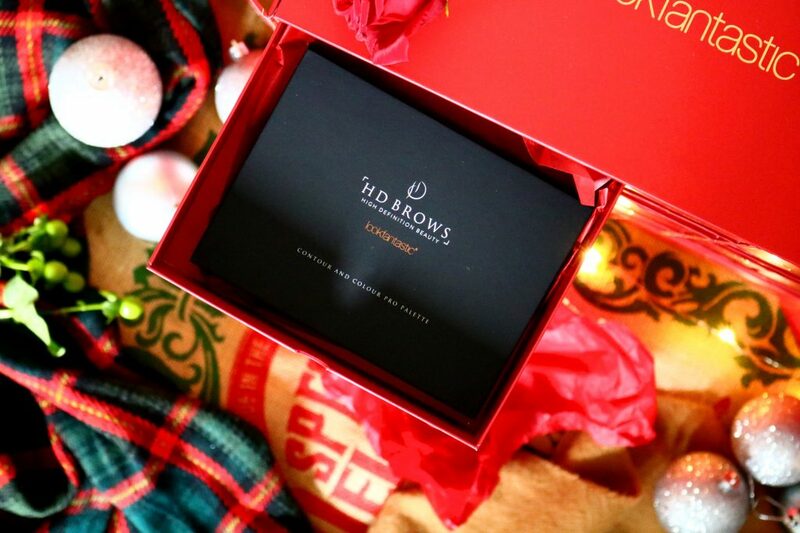 Molton Brown is one of those luxe and indulgent brands that is perfect for this christmas period as the gifts sets and products always seem like true treats so I was very happy to find a very decently sized Molton Brown product in the advent calendar. 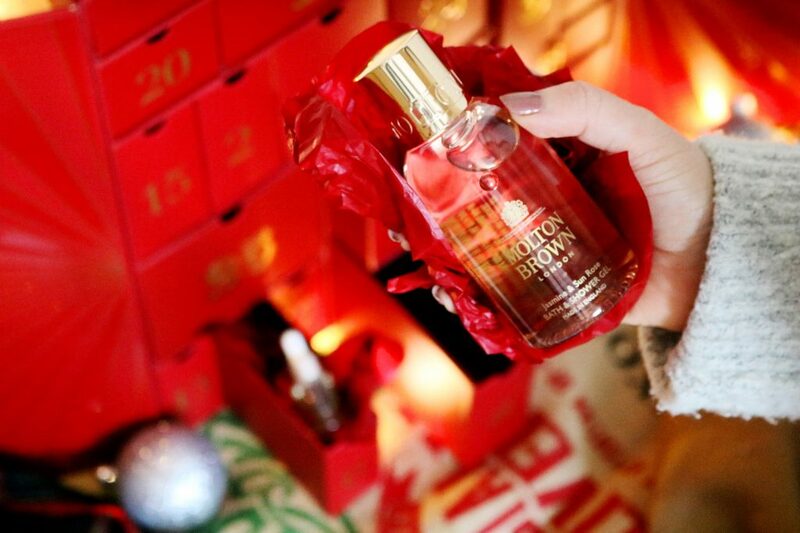 The scent is just gorgeous, as all Molton Brown products are and it is an amazing size too, nevermind that it’s for an advent calendar. I’m extremely happy with all but a couple of the items in the box and while this isn’t really one of them, I think it is a little strange to have a toothpaste included in an advent calendar, especially one as luxe as this one. However, I’ve tried this toothpaste before as it came with a subscription box a couple of months ago and it is very effective yet gentle. I received my first Omorovicza product in the March 2018 LookFantastic box and it was the heavenly balancing moisturiser which I utterly adored so I’m glad to have another product of theirs to try. I’ve only been able to try the cleanser once so far but my first impressions are very good! Next up is one of the nicest smelling body creams I’ve ever tried and again it’s from a brand that I tried years ago! Rituals is a brand I would love to try more from as all of their products sound wonderful, including this one. The scent to me is fresh and feminine cherry blossom which isn’t quite right for the time of year but it’s so gorgeous. The cream itself feels very nourishing, smoothing, softening and leaves the delicate scent on the skin. I love treating my hair to masks, particularly during the summer and winter months when my hair is subjected to the harsher elements and I think this one will be perfect. I love the packaging, the scent is very nice and the size is good for a couple of uses too – I can’t wait to give it a go soon. I love the wide range of items included in the calendar as they’ll definitely be something for everyone but sadly this one just isn’t for me although I’m sure it will be useful and exciting to others. Tanning and my ghostly pale self don’t ever mix but I do like the brand Balance Me which is ideal for my sensitive skin. 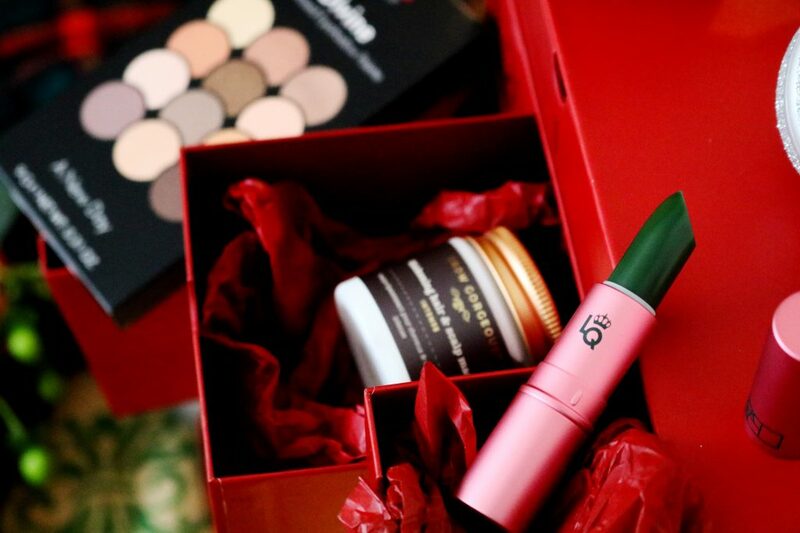 One of my favourite items, as well as the Rituals cream, Blink Brow Bar pencil, Eyeko mascara and others, is the gorgeous Lipstick Queen Frog Prince lipstick. Firstly, the pink packaging is so pretty and secondly, the colour changing (green to pink) lipstick shade just reminds me of the 90’s, which is always a good thing. I love the almost bright berry stained shade I get from this lipstick! 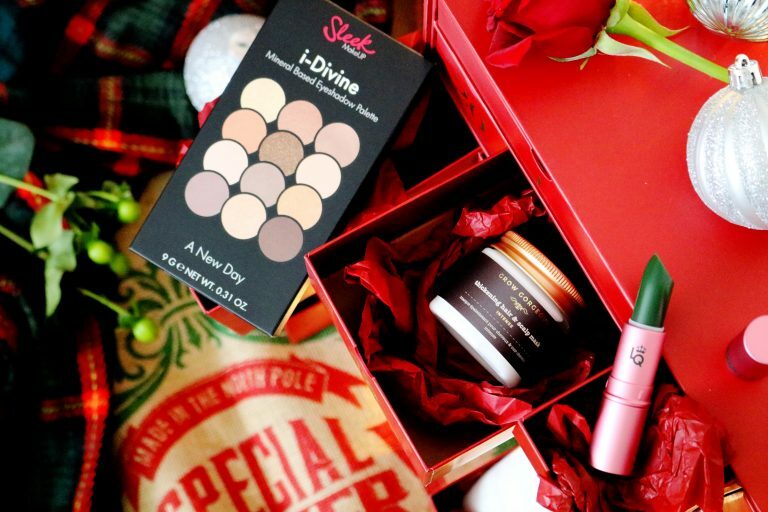 The second of the two full sized palettes within the advent calendar is from Sleek. Sleek were incredibly popular a few years ago for their fantastic and affordable eyeshadow palettes, of which I tried quite a few and they all lived up to the hype. This one (A New Day) features a range of beautiful natural shades that I would wear constantly. There are a nice selection of mattes, shimmer shades and cooler/warmer tones; it’s a fantastic and versatile palette. Winged liner is something I’ve strived to perfect over the years but I am always short of the perfect line; as a result I’m constantly on the look out for new liners to help. It has a very fine nib so it is very easy to get right up close to the base of the lashes – I hold the pen almost on it’s side and just press it to the skin to create a clean line step by step. There are a few brands included that I’ve wanted to try for years, there are other brands I’ve tried a little from and there are brands that I adore, one of them is Caudalie. I’ve tried their wonderful body products, fragrances and divine skincare, the latter is fantastic for the sensitive skin types like mine and this lovely serum is no different. Speaking of brands I’ve wanted to try for years, First Aid Beauty was definitely up there on the list. Their Ultra Repair Cream has been praised from so many bloggers, especially with regards to sensitive skin and eczema which is why I was drawn to it. I’ve had eczema for around 15 years and I’ve thankfully found products and treatments to help but I’m always wanting to try something new to see if it will help. I’ve been loving this cream so far as it’s gentle but effective and it doesn’t irritate my skin in any way. One of the side effects or consequences of eczema is incredibly dry skin so this product seems perfect to me. It’s a luxe moisturising treatment that is to be used before bed for hydrated and smooth skin in the morning so I can’t wait to try it soon. I’ve been lucky enough to try this product previously in a subscription box and I’m glad I have a replacement as this heavenly scented roll on is great for before bed or taking with you on the go whenever you need a calming and relaxing concentrate to breathe in deeply when life is getting a little too stressful. Behind box 21 of the advent calendar there were two products, both from the same brand, Mane and Tail. It’s actually designed for horses but somewhere along the line, it was found to be great for humans too! I have tried their products before and to be honest, I wasn’t blown away but I’ll try these and report back. So many of the products in this advent calendar were already favourites of mine or they have become instant favourites and this brush is one of those. I use a fan brush for my highlight almost every time I wear makeup but this one is so much softer. The other end is one I’ve been using for my foundation! 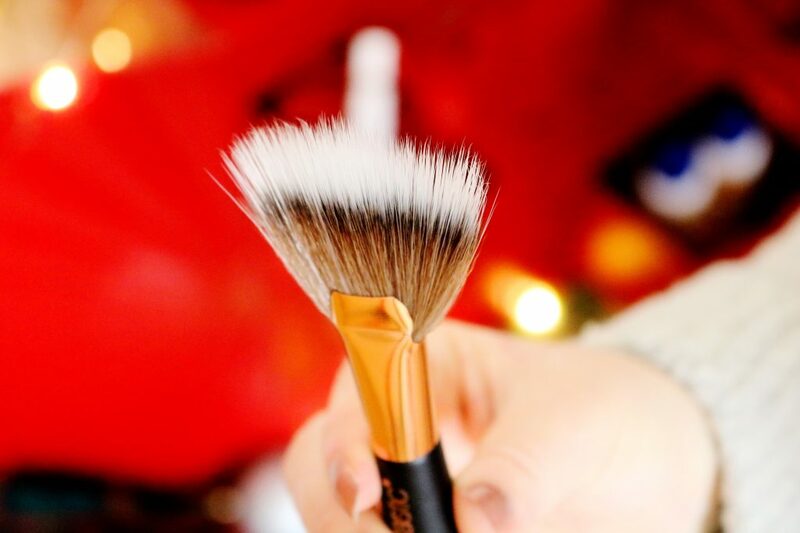 I love how multi-use this brush is and the bristles are incredibly soft! I love using rich and indulgent bath products at this time of the year to stave off the impending chill and dryness and one of the best products for that includes bath oils. One of the best bath oils I’ve tried was from Aromatherapy Associates which are so divine and very luxurious. The penultimate item for the advent calendar is from a brand I haven’t heard much about but it looks intriguing. It’s almost a mini sheet mask just for under the eyes and it’s also one of the few products that I haven’t tried yet but I’ll have to try it soon as my under eyes can be very dry, especially during this time of the year! Behind the final door, door 25, was a very exciting product from an interesting and innovative brand. I have loved the Illamasqua products I’ve tried but I haven’t ever tried their powder products. This highlighter comes nicely packaged, their products always look so sleek and effortless and the highlight itself looks so beautiful. On the skin Deity is a gorgeous ‘glow from within’ style of highlighter as thankfully it doesn’t have huge glittery chunks! It’s the lightest shade of the four available and I’m glad it’s the one in the advent calendar as it looks beautiful on the skin. 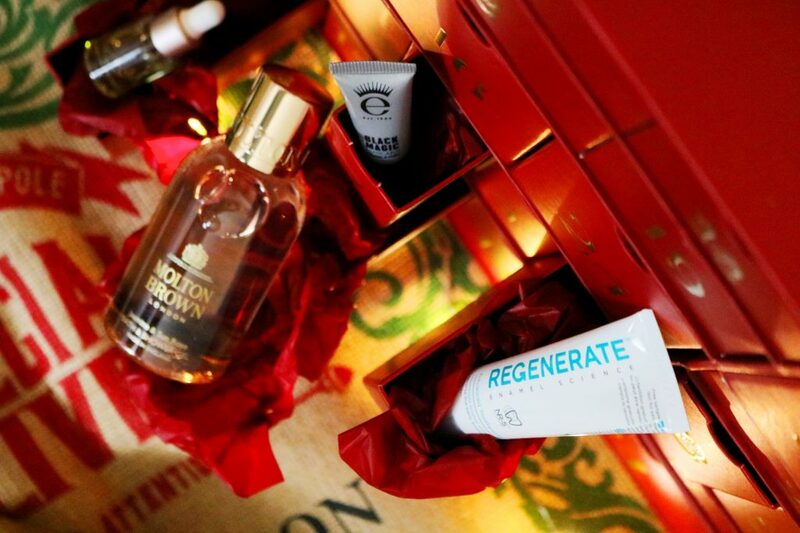 Overall, I couldn't be more impressed by the 2018 Lookfantastic advent calendar as there's such a wide range of products including quite a few luxe brands. The advent calendar looks amazing, I adore the design and it would make for such an indulgent and special Christmas present for yourself or someone else! I cannot recommend it enough and if you want one then you'll have to be quick before it sells out!